Tuck Landscape excels in bringing your ultimate outdoor environement into focus. We've spent over 30 years forging exceptional design, build and maintenance teams that can maximize beauty and success of any project. Our team approach reflects the best standards in the industry. Transformation begins with clear design concepts. Our designers at Tuck Landscape merge site requirements, client needs and aesthetics to create outstanding outdoor spaces. They bring a fresh approach to each project. 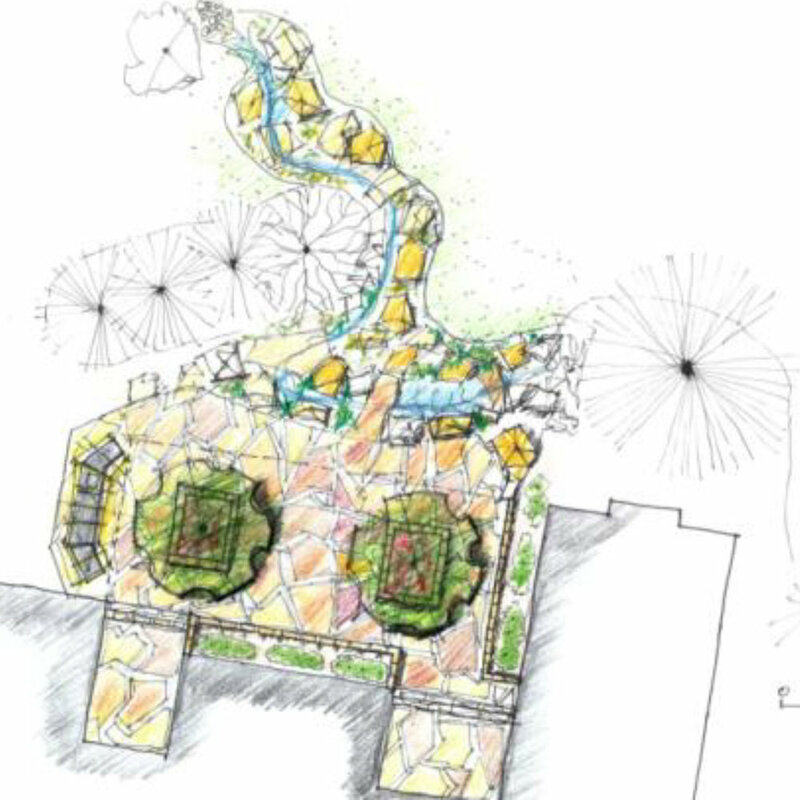 From a quick "napkin sketch for a backyard upgrade, to a landscape master plan, Tuck designers find the surest way to bring your project to fruition. Delivering the landscape you've always dreamed of is our highest priority. Our construction teams turn powerful ideas into powerful landscapes. Craftsmen who take quality to heart, they create and complete projects efficiently and in high style. Excellence is always their guide. Tuck foremen specialize in strong solutions: large stone slabs for paths and stairways, tight-jointed dry stack walls, bold water features and specimen trees with immense character. We can't move mountains but you'll think we have. Once our construction teams have completed your installation, Tuck Landscape maintenance crews will strive to show your landscape at its best. The crews are reliable, proactive and responsive to client needs. They plant seasonal color displays as well as maintain existing landscapes. Our specialists can troubleshoot lawn, irrigation and water feature problems. This comprehensive approach assures the satisfaction of long-term repeat customers. When the snow starts to fly, we are on standby to ensure a clean clear drive awaits your arrival or departure. We don't stop there; we make sure all areas of the drive are clear of snow as well as any designated sidewalks or pathways. With a fleet of trucks and skid-steers, we are able to maintain residential drives and commercial lots, as well as offer and recommend certain de-icing options to accommodate your needs. Since beginning in the landscape industry over 30 years ago, Tuck has been consistently making a positive impact on the environment. General contractors will be pleased to know that Tuck has extensive knowledge in LEED design strategies as it relates to landscpaing. The LEED rating (Leadership in Energy and Environmental Design) is a nationally accepted benchmark of the U.S. Green Building Council for the design, construction and operation of high-performance green buildings. If you are interested in incorporating LEED standards into your project, Tuck Landscape is here for you.